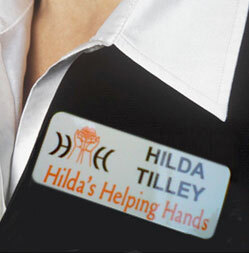 Yesterday my client from Hilda’s Helping Hands and I attended an event and there were no nametags distributed for the attendees. Fortunately, Sherelle and I have a custom nametags that we keep in our purses for such occasions. Yesterday we were the ONLY ones in the seminar that had our names displayed and everyone noticed. Even the host referred to us because of it. It made us stand out. MyNameBadges.com is the place where I get my custom tags, and they’re super affordable. What’s interesting is this simple $20 tool makes you stand out like a million bucks! Imagine being at a conference or event where there are no name tags? People will speak to you just because you make it easier (which is what happened to us all afternoon. I want you to get this resource this week. Just send them your logo, they’ll send you a proof, and you’ll have it in the mail by week’s end!